Participants must be at least 6 years of age and weigh no more than 260 lbs. Guest must fit into harness and helmet in a safe manner (we suggest children be taller than 48 inches). Not recommended for pregnant women or guests with back or neck injuries. After exploring the rainforest on our famous aerial tramway, take flight on our exciting canopy zip-line adventure. Feel the rush of adrenaline as you zip along ten cables – five of which are over 650 feet long! 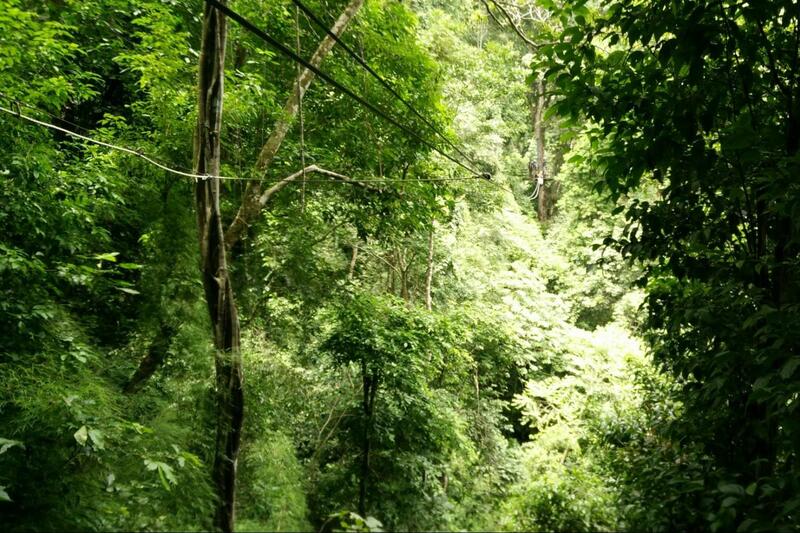 Stretching an impressive 1,035 feet through the rainforest, our fifth cable is the longest. Experience over a mile of high flying adventure in the tree tops as you enjoy views of a rich rainforest ecosystem thriving high above the forest floor. Your visit to the Rain Forest also includes a walking tour of our Heliconias Flower Gallery, Medical Plants Garden, exciting Snake Exhibit and a 45-minute guided nature walk, all accompanied by a bilingual naturalist guide (English/Spanish). It’s the ultimate Rainforest experience!